The Orders list helps you manage your Upsales closed and lost orders. Change an opportunity to a closed status to add it to your Orders list. Or create a new order from scratch without having to start from an opportunity. Select Create order from the top of the Orders list. Enter a Description to provide more information about the order. The default stage for a new order is shown. An order can only have either a Completed - order stage (Probability 100%) or a Completed - no order stage (Probability 0%). If the order is related to a specific Campaign, select it from the drop-down list. You can select another user from the drop-down list next to the currently signed in user name (at the top) to indicate another sales representative for this order. 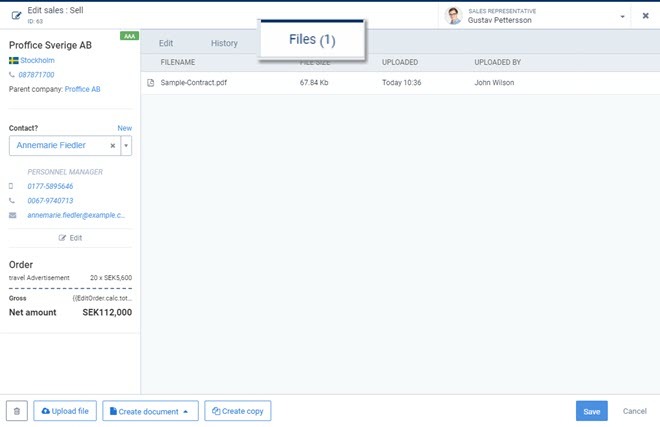 You can upload one or more files, such as a contract, to attach to an order. Open the order from the Orders list or the Sales Board. When you close the Upload file window, the Order remains open. You can upload multiple files to one order. You can view the list of attached files on the Files tab of the order. Select a file to view it or download it, depending on the file type. You can create a copy of an order to start a new opportunity or order just like it for repeat orders or even similar product orders for different companies. The Create opportunities screen opens. All of the fields are pre-filled with the details of the copied order, but you can change any of the details you set in a new opportunity. How do I send the order to my customer? 1. Create a related document using a template. Then send the file through email. 2. Use an App or custom integration to connect with your invoice service such as Scrive or Oneflow.